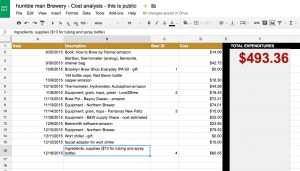 Brewery Cost Analysis (per beer) – humble man brewing. Besides how incredibly fun and rewarding this hobby is, I’m in it for the cost savings too. I know when you buy about $20-something worth of ingredients and do a 5 gallon batch, you’re looking at about half a buck a beer. And this is for good beer. So I decided to do a spreadsheet (Google docs) and figure out. Right now I’m sitting at about $21 a beer. Yeah! Of course, as the initial equipment investment winds down and I getting 40-something bottles of beer per batch, that cost-per-beer will become much more attractive. Right now I’d love to see it come down to, say, the cost of buying a beer in manhattan or something like that. That would be an improvement! Soon I plan to add a healthy number of beers yielded from batch #4 (just brewed today!) and bring that number down. On this sheet are expenses, on another sheet, the cost per beer is calculated. As I keep spending, brewing, and getting product, I will keep it updated here. Copyright © 2019 humble man brewing.. All rights reserved.